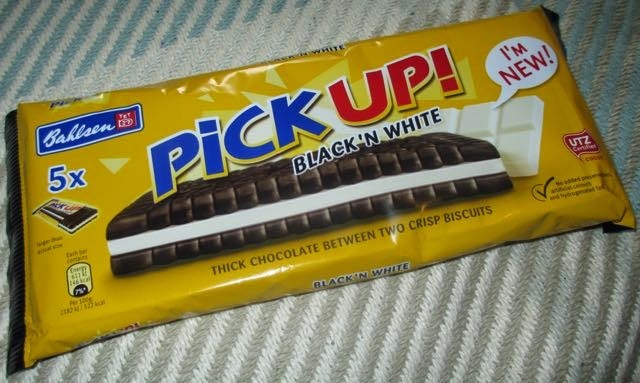 These Black 'n White Pick Up! biscuits have a white chocolate bar set between two milk chocolate flavoured biscuits. Been as though I like white chocolate so much, Cinabar passed me these to try. On opening the packet I first noticed how crumbly the outside dark brown chocolate sandwich biscuit was. This is not a biscuit to eat in bed if you're that way inclined. So I had to get out of the bed pretty quickly before I received a stern telling off! There was a slimline piece of white chocolate that ran beween the two biscuits much like the shiny picture on the front of the packet, but fortunately not that shiny as I'd start to wonder what made the sheen. Although not eating it in a particularly well lit room I was still relieved of the matt biscuit and white chocolate. The hard white chocolate centre made eating the already crumbly biscuit even more crumbly in an over exaggerated super crumbly way making me wish I'd used a plate. Now I will probably have to get the Hoover out. The biscuit itself (once I'd stopped panicking over the crumbs) tasted great. There was the crumbly milk chocolate outer sandwich biscuit taste to start with, and then the creamy inner white chocolate merged with this flavour to present a lipsmackingly luxurious creamy milk chocolatey aftertaste that made me want another biscuit. These Pick Up! biscuits are perfect for a lunchbox, or afternoon snack with a coffee or pot of tea, and especially if you're having a meeting at work with four other people. Just don't forget some plates! Produced by Bahlsen in Germany. Five in a pack. Per 28g bar there are 146 calories, with 7.6g of fat and 10g of sugar. Ingredients included; white chocolate (34%), milk chocolate (10%), sugar, wheat flour, cocoa butter, palm oil, whole milk powder, cocoa mass, low fat cocoa powder, glucose syrup, clarified butter, skimmed milk powder, salt, raising agents; sodium carbonates, diphosphates, emulsifier; lecithins (soya); ground hazelnuts; flavouring (milk), whey products, starch (wheat), acidulant; citric acid; and hen's egg yolk powder. I think they have more of a biscuit crunchiness which makes them so moreish with the snappy chocolate in the other version.